Intrahepatic bile duct stone (IHBDS) removal is usually performed under contraindication of ERCP. 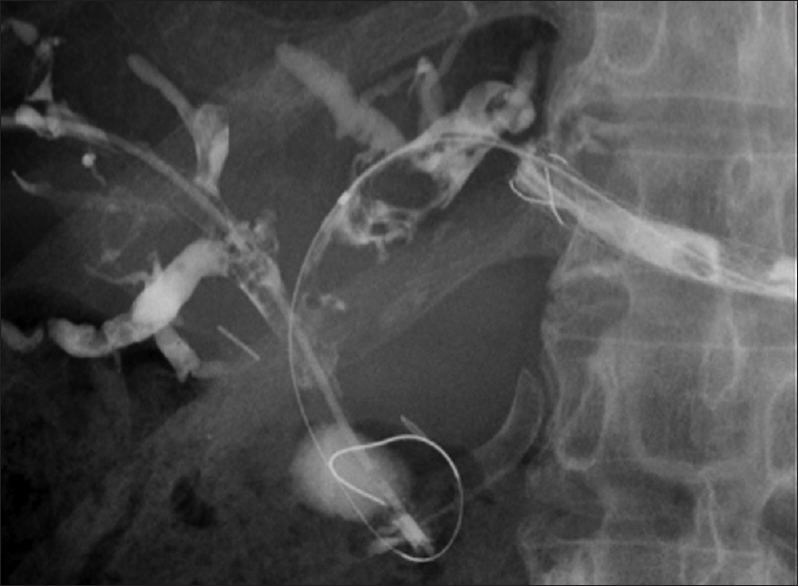 However, if patients are complicated with contraindication of ERCP such as surgical anatomy or duodenal obstruction, this procedure may be challenging. As alternative method, EUS-guided transluminal biliary drainage has been developed.,, Recently, various techniques, such as antegrade stone removal, have been also reported under EUS guidance., However, antegrade stone removal has risk of complicating acute pancreatitis and technically difficult because push ability of devices may be limited due to the structure of biliary tract itself. If stone removal is attempted through the fistula, stone removal is also challenging due to the same reasons although risk of acute pancreatitis may not be absence. Herein, we described technical tips for IHBDS using novel basket catheter (COAXiS, Gadelius Medical Co. Ltd, Tokyo, Japan) [Figure 1] through EUS-guided hepaticogastrostomy (HGS). 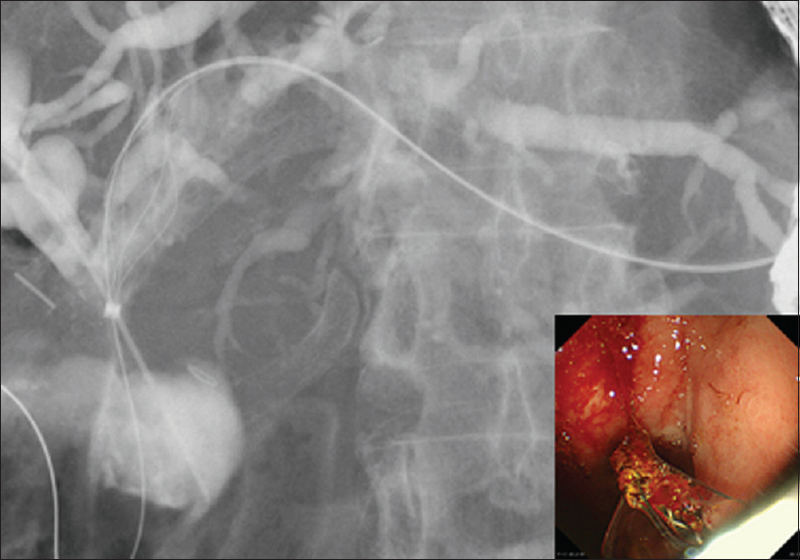 An 82-year-old man underwent percutaneous transhepatic biliary drainage (PTBD) for hepaticojejunostomy anastomotic stricture, which was complicated followed by extrahepatic bile duct resection for gallbladder stones 10 years ago. Frequent cholangitis due to IHBDS was observed [Figure 2]. He did not agree with undergoing PTBD; therefore, EUS-HGS using covered metal stent (10 mm × 10 cm, Niti-S Biliary Cover Stent, TaeWoong Medical, Seoul, Korea) was attempted [Video 1]. After 7 days, IHBDS removal was attempted because the operability of devices was limited due to long covered metal stent. First, the contrast medium was injected, and IHBDS was seen [Figure 3]. Then, metal stent was removed. Because IHBDS was relatively large, therefore, stone fragmentation using electrohydraulic lithotripsy (EHL) under cholangioscopy (SpyGlass DS; SPY-DS, Boston Scientific, Japan) was attempted [Figure 4]. An electrohydraulic shock wave generator (Lithotron EL27, Walz Elektronik GmbH, Germany) was used to generate shock waves of increasing frequency, which were applied as a continuous sequence of discharges during EHL. A 2.4-Fr EHL probe was used, and EHL was performed under SPY-DS guidance. After IHBDS fragmentation was obtained, stone removal was performed using basket catheter. 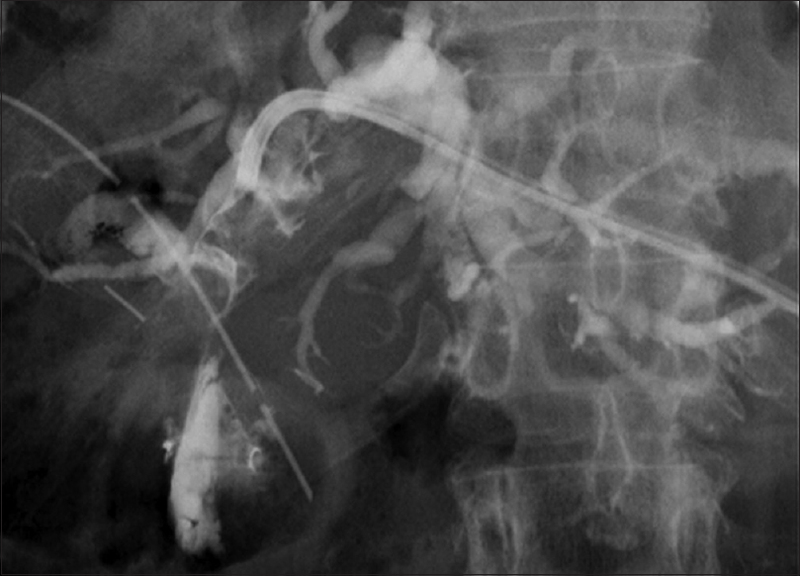 Because this basket was coaxial with the guidewire, we easily performed this procedure and successfully performed IHBDS removal [Figure 5] and Video 2]. Finally, plastic stent deployment was performed from the intrahepatic bile duct to the stomach without any adverse events. 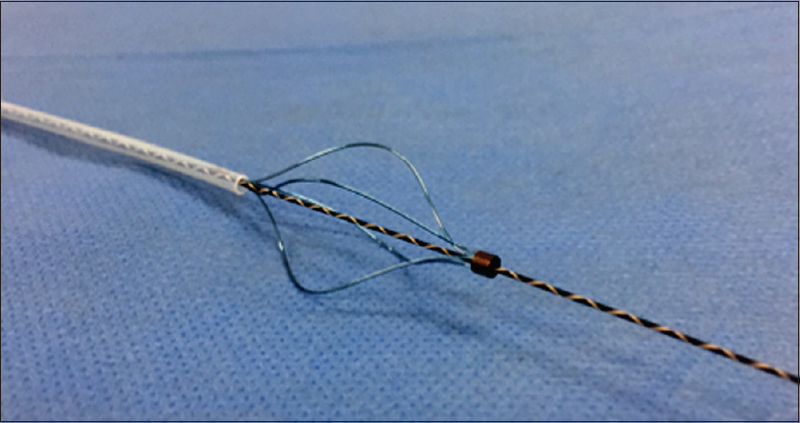 Our technique using novel basket catheter may be useful for IHBD stone removal through EUS-HGS. Teoh AY, Dhir V, Kida M, et al. Consensus guidelines on the optimal management in interventional EUS procedures: Results from the Asian EUS group RAND/UCLA expert panel. Gut 2018;67:1209-28. Baars JE, Kaffes AJ, Saxena P. EUS-guided biliary drainage: A comprehensive review of the literature. Endosc Ultrasound 2018;7:4-9. Iwashita T, Nakai Y, Hara K, et al. Endoscopic ultrasound-guided antegrade treatment of bile duct stone in patients with surgically altered anatomy: A multicenter retrospective cohort study. J Hepatobiliary Pancreat Sci 2016;23:227-33. Itoi T, Sofuni A, Tsuchiya T, et al. 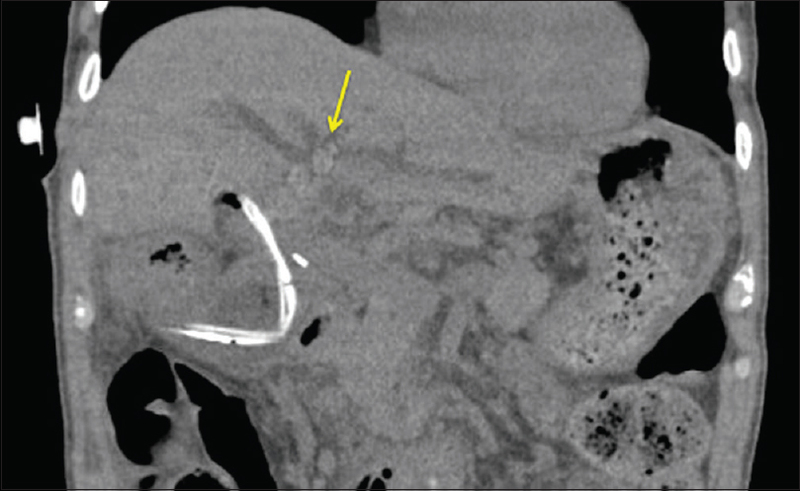 Endoscopic ultrasonography-guided transhepatic antegrade stone removal in patients with surgically altered anatomy: Case series and technical review (with videos). J Hepatobiliary Pancreat Sci 2014;21:E86-93.